Spending any time outdoors in Big Bear is a wonderful experience, but there is something extra special about spending time in Boulder Bay Park, no matter what the season. 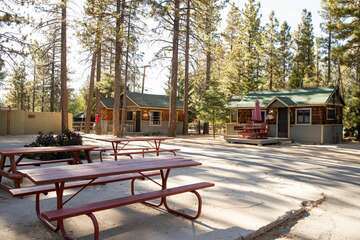 Located about two miles east of Big Bear Dam, it’s a relatively new park that was constructed in 2010. It has become a popular play area for locals and tourists alike. We like to spend the occasional lunch picnicking here in the summer; it’s the perfect spot for people watching as we eat our peanut butter sandwiches, and it’s always fun to get away from the office for a short break in the middle of the day. But never fear—someone is always on hand to help you reserve one of our fabulous Big Bear cabins! 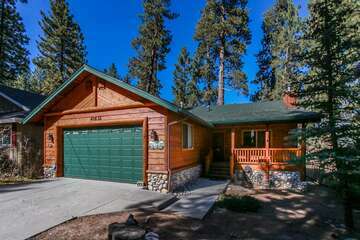 Read on to learn more about what you can experience in the beautiful Boulder Bay Park Big Bear. It might be easier to tell you what you can’t do in the park- that’s how much fun can be had here! Summer time in Big Bear Boulder Bay means canoeing amongst the rock islands, fishing off the docks, or picnicking during lunch and on weekends. The bandstand offers the occasional summer concert series, and people watching, as we mentioned earlier, is a prime activity in the summer. From the cute to the unusual, there is no shortage of interesting and fascinating human behavior to observe from your perch on a picnic table, large boulder, or dock. In the fall, as the weather cools, the leaves on the trees in the park change to crimson and gold, creating breathtaking photo opportunities. In the winter, Boulder Bay Park Big Bear is the spot for snow activities. Sledding and snowball fights are more fun with the family—bring yours and have the time of your life! And finally, in the spring, as green buds start popping on the trees, flowers start blooming again, and nature slowly awakens, the park is once again a hotbed of activity. Hike around the lake, enjoying the feeling of the sun’s warmth on your shoulders, or rent a canoe and kayak. The season begins April 1st. Just remember, the water can be cold, so try not to fall in! Bring your kids, bring your spouse, or come alone; there’s always something fun to do at Boulder Bay Park. What are you waiting for? 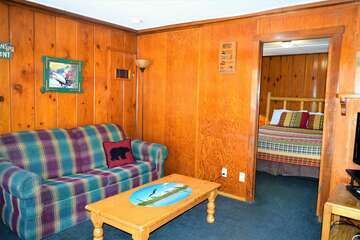 After you’ve spent a long day enjoying the park, you can rest easy knowing you will be coming back to your romantic and rustic Big Bear cabin. Book yours today and discover the fun side of southern California in Boulder Bay Park!